The continent of 'magical realism' and the world's longest running guidebook series. Here is the pick of the current bunch. Latin America takes in a fair few countries, so travellers tend not to stick to just one. Apart from Brazil or Mexico it's quite common to travel in several countries on one trip and not uncommon to cover the whole region. For this reason regional guide books have been concentrated on here, picking out the best and naming and shaming the worst. Fiction in this region is great and you could do much worse than reading all the recommended fiction listed. Apart from a few places books are hard to get on the ground in Latin America. Now a greatly improved third edition, living up to the Rough Guide reputation, this excellent guide gives you all the info you'd need to plan a trip to South America. It's a pretty good book if you have no idea which part of the continent to go. It gives you a brief view of each country and important places to visit in each country. However, it does not give you fine details like the culture, transport, eating, etc. Once you finalise where to go, you may need to buy a separate guide book such as a Footprint Handbook. Although a solid guide overall, I would recommend the Footprint guide or RG over it any day. LPs always look up-to-date, but sadly this was certainly not the case with this title (Footprint and update every year). Transportation information is generally accurate. Costs though were often way off the mark. Overall this book has some advantages over the others such as Footprint covers Mexico as well which you might not want. How come Footprints are just so good in Latin America? Not as good as the South American version, but very good for a region guide (don't expect it to be as good as LP or RG single country guides. The guide could improve its weak, mediocre maps. Also frustrating, in all Footprint guides, is the use of a code for accommodations prices. Instead of just stating the price per room, Footprint gives you a cumbersome group of letters that correspond to the cost of the room. So it's as comprehensive as you'll get in a multiple country handbook (if you're planning on spending a lot of time in one country get the footprint/LP/RG guide for that country). Well it took over six years but finally Rough Guide updated their old previous Central America offering at last another respectable and up-to-date choice of guide in Central America for those who don't want the Mexico coverage that the Footprint provides. Now second edition and much improved, exact prices are given whenever possible, information is spot on. Recommended. Compared to the LP which is very good and the Footprint, roughly speaking I would say this is the best Mexican guide. Rough Guides are ideal for a certain kind of holiday. If you are planning to go to an all inclusive resort in Cancun and only venture out for arranged excursions then this book will never leave the shelf. Rough Guides are for those who want to explore the real thing. The factual information is accurate and helpful. Information on archaeological sites such as Coba and Chitchen Itza was extremely helpful, the travel tips essential. The only slight reservation is that a bit of snobbery sometimes slips in. First things first. The Lonely Planet South America is awful and the Rough guide version is not much better. Since the South America Handbook first came out (almost over 80 years ago) the number of guidebooks to South America has soared but none comes close to The Handbook's yearly updated formula and long standing author. The layout and organisation of the entries is sensible and logical, and the book manages to cram a great deal of information into each page. It is easy to find recommendations for places to stay and eat and the maps and comments on the sights are sensible. (In fact for many cities this book, which covers the entire continent, includes more detail than some guidebooks which cover only a single country). The colour maps at the end of the book are particularly useful - they save having to carry a pocket atlas around with you. The sections on diseases, travel problems and history have been updated and remain excellent. The "directories" (of useful places and telephone numbers etc) have been kept up to date along with the recommendations on accommodation and eating. The few mistakes that you will spot in the book stem from Footprint's lack of resources to patrol all the continent all the time. These can be very annoying, but even with these quibbles it is much more up to date than the competition. It's just a shame about the town maps which are poor and nowhere near the quality that travellers now expect (LP are still the map kings). Published: 92th edition (December, 2015) - if you don't have the latest edition, don't worry too much as long as it's only a few years old. Next edition: December, 2017. New updated, but still not as up-to-date as the Footprint, which I'd go with, but the choice is yours. Following the Lonely Planet guides gives you a great generic Lonely Planet experience. But if you want something more or different, the options aren't there. Sure, it's colourful, and yes, it is useful as a map book, but as your only source of information on a vast continent, take the Footprint title. Getting better with each edition, this a big improvement on the last. Not bad, but second rate to the Footprint unless you just love Rough Guide. Getting a little out-of-date, and a slimed down version of the Footprint South America handbook with more detail and specific content. If you are just visiting Peru, Ecuador and Bolivia you won't want all the info on other countries the big book offers, nor will you want three separate guides. This then is a good selection with some specific details, history and maps not in a guides covering the whole continent (Let's Go have a version too, but it needs an update. There is also a Bradt Guide called the backpacker manual which is great, but sadly very out-dated now). Far from a perfect guide (many might prefer the Rough Guide which is also very good), but it's maps are accurate, its places to stay and eat are reliable, and it offers extensive info on the sights and activities for every town included in the book. But Brazil is a dynamic country, particularly its economy and that has an impact on all prices quoted. A few weak areas: the language area should be strengthened by providing more information on pronunciation; where and how to exchange money needs to be updated, especially when exchanging cash; budget and moderately priced accommodations for Rio should be expanded. A hardback book, this is simply the best guide to Brazil. Lonely Planet is the glossiest and is well designed. But appearances are, as they say skin deep. Footprint is more honest, more informative, far more knowledgeable. Rough Guide is decent enough, but falling somewhere between the LP and the Footprint. There is no point in going to Brazil if you aren't prepared for the cultural experience and don't know how to find a good music bar or club where locals go, or decent place to eat when you want a special occasion. No one speaks English. You really need a good book in this country. Probably best guide for Chile. The Footprint or Rough Guide Chile are okay, but this is the best. It is fantastically accurate, maps are clear and easy to use, recommended hotels and restaurants are almost invariably good, and the attention to detail in descriptions of even the smallest towns strikes the right balance providing good information for travellers on varying budgets. There are tens and tens of individual guides for most places across South America and for the case of many, two or three choices. However, we have picked this one out as an excellent focused resource for an area which requires much more information than a standard regional or even country guide to explore properly. If you are just hitting this area in Peru - go with this book. Also includes the Sacred Valley, Machu Picchu, and the southern jungle. Also worth recommended, but now out-of-print is the Footprint Cuso and Inca Trail. Cia suggests The People's Guide to Mexico, by Carl Franz, first published about 1970. 'I read it before going for the first time when I was nineteen, and it taught me so much! All about Mexican culture and the vicissitudes of travel and living there, many funny stories of their experiences, and many useful lists of everything imaginable, by a man who deeply loves Mexico and its people.' It's truly a super resource for anyone planning on traveling in Mexico. Set mainly in Honduras on/in The Mosquito Coast, the story is told through the eyes of Charlie Fox, a typical American boy. The story he tells us chronicles the "adventure" his family has when his father, Allie Fox, takes them all to live in the Honduran jungle. This is a stunning book and a cracking read. The story is fantastic; a mixture of sarcastic humour, adventure and emotion. An inspired knock-off of Gabriel Garcia Marquez and very funny. These excellent books should be read in the order in which they were written in order to be best appreciated. The first (and by far the best ) 'Don Emmanuel' gives you deep insights into the mind of the author - his depth of research, his passion and his humour. The mood created reflects the culture of South America the vastness of the place, the remoteness of the terrain, the fiery temperaments of the women, the ancient unknown history of the continent - as dense and impenetrable as the mysterious jungles. "Cardinal" continues the general themes and mysticism, while the "Coca" book is a hard hitting contemporary anti drug wars tome, being shorter but faster moving and a bit easier to digest. Highly recommended when you have had enough of 'One hundred years of Solitude'. Set in Colombia and possibly the best book ever written, but be warned: this is not a clear-cut story; the prose can be confusing, and the repetition of names makes it more difficult by far to keep track of who is who (cross them off on the family tree in the front of the book). The novel does indeed cover one-hundred years, so expect to see favourite characters die if they first appear early on. There is no one protagonist. The family is the protagonist--the family, and the town. In the tradition of South American literature, this is a pretty incredible book. This Chilean author is very much in the Marquez tradition - a cast of bizarre characters telling a story that covers generations and includes psychic abilities, ghosts and bizarre accidents - but the book is much more focused and down-to-earth than '100 years'. What makes this book special is how it takes your affection for this family from the unusual to the deeply serious, as revolution ravages the country. The final 150 pages or so are harrowing stuff, and deeply affect you. The plot is compelling, the characters brilliantly drawn, and it is an amazing achievement for a first novel. If you really liked it read Eva that lets you into some of the true story behind the novel. This is a travelogue type book that has a few laughs, but behind the slightly juvenile drug obsessed and slightly improbable story line is an easy to read style of writing and some good and intelligently written information on Bolivia, Peru, Colombia etc. Hard to put down and reads like a great Latin American novel. Journalism at a very high quality. Jones is not blind to Chavez's flaws and "undiplomatic" manner. But he makes clear how Chavez, alone among Venezuelan politicians of the post-independence era, has captured the imagination of the poor and made them a priority in his economic and social policies. The accounts of Chavez's original failed coup, and the coup attempt and strikes against him after he took power, are absolutely palpitating. We have read a lot of biographies and "Hugo" is simply the best. It is well researched and reads more like a fast-paced thriller than a non-fiction account of Hugo Chavez. It pulsates with the energy that Hugo Chavez himself generates. This book is a must read for anyone who wants to know what is really happening in Venezuela. Reader Recommended: tells the story of the Incas, the discovery of them by the conquistadors and the author's journey to find a long lost site to rival Machu Picchu. Archaeology, History, Adventure - and funny too. If you want an irreverent account of travels through Peru and Bolivia then Inca Kola by Matthew Parris is also a very good read (UK only). Recommended: a very good account of Paraguayan history. John Gimlett intended to write a fictional account of his travels through the country, but loathe as I am to use a cliché, the truth about his journey really was stranger than fiction. All in all, this is a very interesting book. Wonderfully researched and is full of awesome facts and numbers. Tail of mountaineering and a personal accident. Two English climbers set out to climb the remote western face of Siula Grande in the Peruvian Andes. Little to do with travel and the region, but gripping and almost impossible not to read in one sitting. Amazing story. Movie of the same name too. A classic that could not be omitted. Not a travel book, Chatwin creates a quest for a piece of prehistoric skin and disguises it as a traveller's account. It is a reflective piece of prose fiction that could be called a novel. 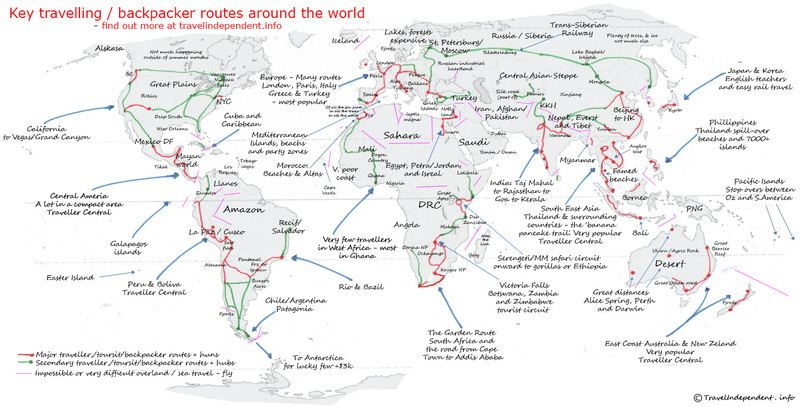 "Tourists don't know where they've been... travellers don't know where they're going."